Software ATENA Science was used to perform material test models together with thermal and static analysis of a real-size experiment by Mr. Lukáš Blesák and Mrs. Eva Caldová under the leadership of Prof. Wald at Czech Technical University in Prague. Coupled timbre-SFRC structure (SFRC - steel fibre reinforced concrete) exposed to the actions of elevated temperature and mechanical loading represents both geometrically and physically non-linear problem. Numerical simulation of such a complex problem requires a certain amount of preliminary research in order to define not only the proper thermal and mechanical properties of the applied materials, which is rather essential, but also defining the most suitable way of performing a numerical simulation considering the mesh size, finite elements type, solution method, interval step size and other. 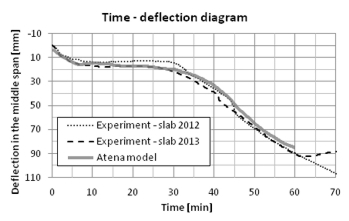 The results of ATENA calculations were compared with the experimental ones in parallel. Pre-processor GiD and consequently Atena Science solver were applied. The results were analysed and a further discussion was open. The ongoing project is majorly focused on definition of SFRC material properties in elevated temperature and the global behaviour of structures made of such material. 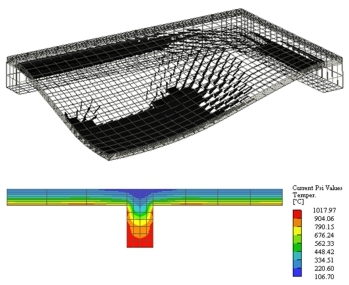 The ability to simulate civil structures in such conditions helps to understand and predict their behaviour in real fire scenarios, propose a further research in this filed and so improve the application of fibre concrete into the civil engineering practice.